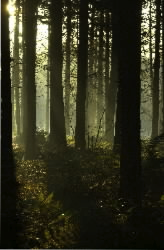 King's Wood forest extends for about two square miles between the villages of Chilham, Challock and Boughton Lees. It sits at the top of the North Downs and spreads into valleys with ancients woodlands of oak, lime, ash, hornbeam and yew. More recent economic crops include chestnut, fir and beech trees. King's Wood is home to many wildlife including fallow deer, dormice, bats, and nightjars, reptiles and amphibians. We are a small club originally formed as a pressure group to campaign against threatened developments in King's Wood. Nowadays we encourage enjoyment of the forest and its natural environment through our Walks & Events, see Downloads page. If you would like to join the Friends a membership form can be found on the Downloads page. Single membership is £7 and joint/family £14 or pay on the day £4.00. Accompanied children are free of charge. See the Walks/Events page for full details or Download a copy. Following a grant from Awards for All we produced a leaflet of circular walks from the villages of Molash, Godmersham, Chilham and Boughton Lees into King's Wood. This is currently being revised, although you can still see the walks online and print copies from the Downloads page.